The Agreement is available in each of the 24 languages of the EU by clicking on the appropriate link in the language menu. 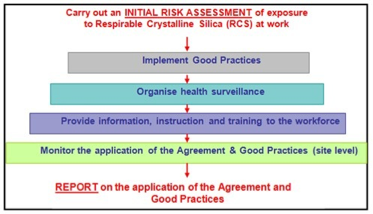 At the cornerstone of the Agreement is a risk assessment procedure of the potential exposures to respirable crystalline silica at the workplace, which must performed regularly so as to help determine which measures or good practices to apply if needed and to ensure continuous improvement. The risk assessment procedure is detailed in Annex I to the Agreement, the Good Practice Guide. Whether deriving from the risk assessment requirements, their results or from provisions in the Agreement, a number of additional measures should be applied in compliance with EU legislation: dust exposure monitoring, training, and health surveillance. The application of the Agreement and Good Practices is monitored according to a specific procedure: reporting is carried-out every two years (starting in 2008) from site to European sector level. This process allows the bi-partite NEPSI Council made up of representatives of each signatory association to draw up a summary report to inform the EC, the Member States and the authorities responsible for health and safety on the application of the Agreement. The Agreement was translated into 20 official EU languages and entered into force 6 months after its signature, on 25 October 2006. It remains open for signature by sectors wishing to join at a later stage. It is an autonomous agreement and is therefore being implemented by the signatory Parties.